Posted October 18, 2015 by William Martin & filed under Lists. Was the voice for the Reverend Mother in “Fires of Pompeii” done by the same actress as Raknos in “Runaway Bride”? Digital alterations notwithstanding, I’m pretty sure I detected enough similarities to at least suspect it. No – Raknos was played by Sarah Parish, and the High Priestess was played by Victoria Wicks. Naoko Mori: Toshiko “Tosh” Sato. also in “Aliens of London”. That was the same character, Tosh was undercover in London at this incident. Doesn’t count. The Peter Cushing movies don’t count. Yes it has. In The Poison Sky Wilf recognises the Doctor from Voyage of the Damned, thus confirming the stallholder was Donnas grandad. If you want to count audio adventures, David Tennant played several characters in a few of the audio adventures before he got the role of the Doctor. “actors who’ve appeared in Doctor Who as different characters” – it doesn’t specify TV series, audio or even canon, ergo movies count. More than that, they explicitly made the connection several times in Series 4, with Wilf and the Doctor recognising each other from the earlier encounter. 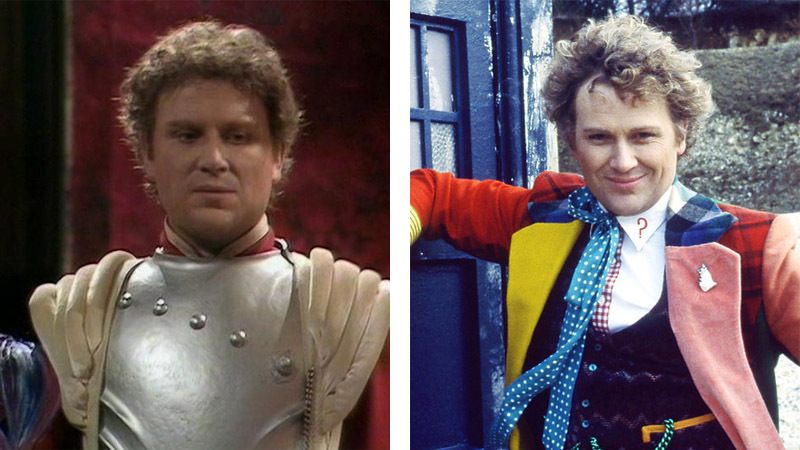 It’s a retcon, but the character in ‘Voyage…’ is most definitely Wilf. Why not? It’s still official, even if not canon. Why not? They’re still Doctor Who, even if it is the universe next door. Plasmavore, sorry. Just realised my spelling mistake. But yeah, there’s one. yeah I noticed that one the other day, when I watched ‘The Curse of Fenric’ for the first time. Christopher Benjamin played H.G. 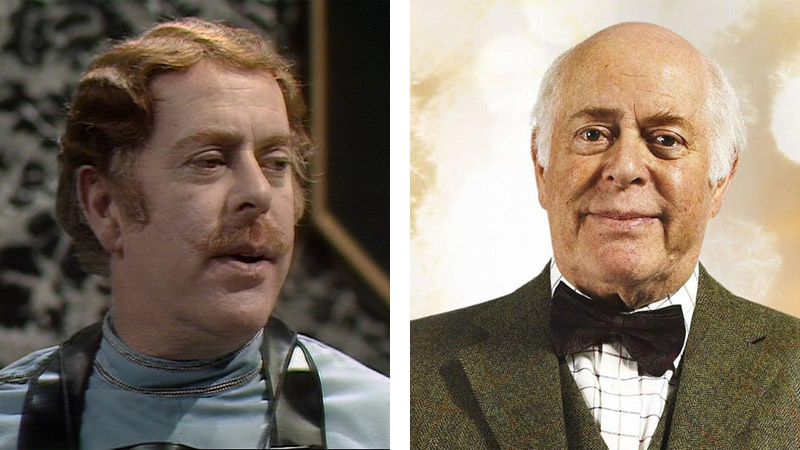 Jago in “The Talons of Weng Chiang” and Colonel Hugh in “The Unicorn and the Wasp”. The Pirate lady captain in Peter Davison’s Enlightenment was also in the Matt smith episode where he and a friend meet the Cybermen, as the old lady at the store watching the one guys baby. Lynda Baron, who was also in the Gunfighters with Hartnell. Best known as Nurse Gladys Emmanuel from Open All Hours. Lynda Baron wasn’t in The Gunfighters, she did however provide the vocals for The Ballad of the Last Chance Saloon! A couple that have been missed. Jacqueline Hill as Barbara Wright and Lexa in the Tom Baker story Meglos and Peter Purves as Morton Dill in the Chase and as Steven Taylor. Oh and how could we forget Lalla Ward? Michael Sheard should be on the list. He was in The Ark, The Mind Of Evil, Pyramids Of Mars, The Invisible Enemy, Castrovalva and The Remembrance Of The Daleks. One of the few actors to have been killed by Darth Vader, as Admiral Ossel in Empire and the Daleks, and also played Hitler in Indiana Jones and the Last Crusade. He was also Hitler in The Tomorrow People and actually played Hitler in no less that five times! It’s later revealed that Goth is the time lord you speak of in the War Games. Same with Gulliver. That is supposedly Goth in disguise, monitering the Doctor. How can you leave out Michael Wisher?!?! Jacqueline Hill and Jean Marsh – They both played a companion of the First Doctor, and then a totally different character several years later. And of course, Patrick Troughton who played the Second Doctor and Salamander in the SAME episode! “Actors who’ve appeared in Doctor Who as different characters”, how does that not count? In that case, you might as well toss Tom baker in there as The Doctor and Meglos. there would then be one for every Doctor except Pertwee, McCoy, McGann, Hurt, and Eccleston. and of course there are all the many many times the Doctor or a companion get ‘possessed’ or ‘cloned’. Leaving the actor playing two parts in the same episode. George Pravda – Alexander Denes in The Enemy of the World, Jaeger in The Mutants and Spandrell in The Deadly Assassin. Actually he played John Frobisher the Permanent Secretary to the Home Office and Torchwood Three’s liaison to the British government. He was later appointed informal ambassador to the 456 in “Torchwood: Children of Earth”. Julian Glover was Richard I in The Crusades and Scaroth in City of Death. Philip Madoc, Prentis Hancock, Stephen Thorne. 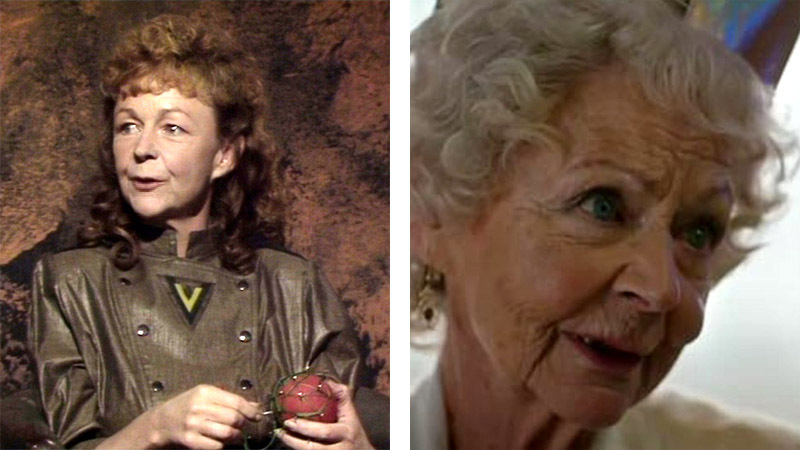 Jacqueline Hill as companion Barbara Wright with the first Doctor, then as Lexa in the episode Meglos with the fourth. Lazy list. There are tons more from the classic series. Where is the Pat Gorman!!??!! This is just 15 of them. By no means is it all if them. Apologies, that should be K9. Lalla Ward as Princess Astra in The Armageddon Factor and then of course as Romana. Yeah, but Romana states that she chose to regen into the shape of princess astra. Jaqueline Hill as companion Barbara Wright and Lexa in iforgettheepisodename. Oh but one problem, this isnt about Sherlock! Louis Mahoney as a newscaster in Frontier in Space, Ponti in Planet of Evil, and as Old Billy Shipton in Blink. Because life is long and you are hot. try GEORGE PRAVDA. I have seen him in 3 episodes with doctors 2,3 and 4.” enemy of the world ” Denes(2),”the mutants” Jaeger(3) and ” deadly assassin” Castellan Spandrell (4). do you know what well known BRITISH BAND was in DOCTOR WHO? clue: it was in the 1960’s. The Beatles were at the beginning of The Chase. They used footage that was later wiped by the BBC (like many of the Doctor Who stories from the 60s and early 70s), so the footage used in the Chase is actually the only surviving footage from that recording. Peter Capaldi as John Frobisher in Torchwood: Children of Earth. Greg: Torchwood =/= Doctor Who. Yeah, the new series is in the Post Time War universe or whatever. Tom Baker as the 4th doctor and then ‘the curator’ in the 50th Anniversary special. Tom Baker as the Doctor and the Curator in the day of the Doctor…? Ah, but are they in fact different characters? Does Richard E. Grant in [i]The Curse Of Fatal Death[/i] count? What about the stuntman from the original series who was just about every Dr Who monster. Lalla Ward as Princess Astra and Time Lady Romanadvoratrelundar (or Romana for short) in her second incarnation. She was listed. She was actually the first one. Neve McIntosh has played 3 characters, all three Silurian woman of the new series: Alaya, Restac, and Vastra. I mean…. I guess you could say Tom Baker as the 4th Doctor and as “The Curator” in The Day of the Doctor, although it was referenced to some degree that he was the Doctor and may have been supposed to be the Doctor there, even though he was old and didn’t have his scarf and all. It was s2 e05 not 07. Neve McIntosh played the female Silurians on The Hungry Earth/Cold Blood. Now she also plays Madame Vastra. Paul Darrow as Captain Hawkins in Doctor Who and the Silurians and as Tekker in Timelash. In fairness, one should always cast Paul Darrow whenever possible. Wasn’t Peter Capaldi also in Torchwood: Children of Earth? This list is far from complete, and many of the comments point out the gaps. Terry Walsh, Dave Carter, Stuart Fell, and Pat Gorman were constantly re-appearing in Doctor Who as background characters throughout the entire 1970’s. How could one forget the great Michael Sheard who made several appearances on Doctor Who? 🙂 He worked with every Doctor during the program’s original run save Patrick Troughton and Colin Baker. He was also a one-time Big Finish audio actor, where he worked with Paul McGann. He appeared in The Ark, Mind of Evil, Pyramids of Mars, The Invisible Enemy, Castovalva, Remembrance of the Daleks, and the audio adventure The Stones of Venice. Does Tom Baker as the 4th Doctor/the Curator count? Yes, according to the latest 11th Doctor comic. Paul Darrow appeared twice playing Captain Hawkins in the serial Doctor Who and the Silurians which was transmitted in 1970 and Maylin Tekker in the serial Timelash which was transmitted in 1985. You forgot Lalla Ward, who played Princess Astra in The Armageddon Factor (1979) before she played Romana’s second incarnation from Destiny of the Daleks onwards (1979-80). Ian Marter also appeared in Carnival of Monsters (1973) before getting the gig as Fourth Doctor companion Harry Sullivan (1974-75). Jean Marsh, who played Hartnell companion Sara Kingdom in The Dalek Masterplan (1965) was also in The Crusade (1965) and Battlefield (1989). And Jacqueline Hill, who played teacher Barbara Wright, one of the first travellers in the TARDIS (1963-65), returned to the program in 1980 as high priestess Lexa, alongside Tom Baker’s Doctor. And if you want to count doubles as other parts, then Mary Tamm (Romana’s first incarnation, 1978-79) also played Princess Strella in The Androids of Tara (1979) and Sarah Sutton (Nyssa, 1980-83) played Ann Talbot in Black Orchid (1982). The Doctors have also had various doubles: William Hartnell played the Abbott of Amboise in The Massacre (1965), Patrick Troughton played Salamander (The Enemy of the World, 1968), Tom Baker also doubled as Meglos (1980) and Peter Davison doubled for Omega in Arc of Infinity (1983). David Tennant and Matt Smith, of course, also played their character’s duplicates (Journey’s End, 2008 and The Also People, 2011). What about Tom Baker? In the 50th. Dan Starkey was Strax, and he was the elf Ian in Last Christmas. Mark Gatiss was also Danny Boy. The actor who plays Strax was an elf in the most recent Christmaa special. Jimmy Vee. Played the Moxx of Balhoon in ‘The End of the World’, Bannakaffalatta in ‘Voyage of the Damned’, Skovox Blitzer in ‘The Caretaker’ and the “pig alien” in ‘Aliens of London’. I think David Troughton was also in The War Games. There are some others, though these were part of the plot of there being dopplegangers, such as Patrick Troughton being Salamander, or Peter Davison as Omega in Arc of Infinity. Philip Madoc has appeared several times too. Lynda Baron who played Val in “Closing Time” sang the song in The Gunfighters and was also in the episodes Elightenment. The voice of “House” in Series 6 was the same man who voiced “456” in Torchwood. Neve McIntosh played two Silurian sisters (Alaya / Restac) before playing Madame Vastra. Then there’s Jeremy (Boba Fett) Bulloch who appeared with William Hartnell in The Space Museum and with Jon Pertwee in The Time Warrior. Michael Sheard played six characters in the original show from 1964 to 1989. Including Pyramids of Mars and his last appearance in Remembrance of the Daleks. Plus they are many more. Wtf Amy pond and the 12th doctor are both in the fires of Pompeii. Come on Internet!! Wendy Padbury played Zoë, and then a few years later a companion named Jenny in a Doctor Who stage play. Not the show, but still official. Katy Manning as Jo Grant and Iris Wildthyme. Small, but Arthur Darvill was in the Alt Universe just like Freema was. He can be seen for a couple seconds and was an extra. Bernard Cribbins played Tom Campbell in Daleks Invasion Earth 2150 AD and later played Wilfred Mott in the 10th Doctors’ series. 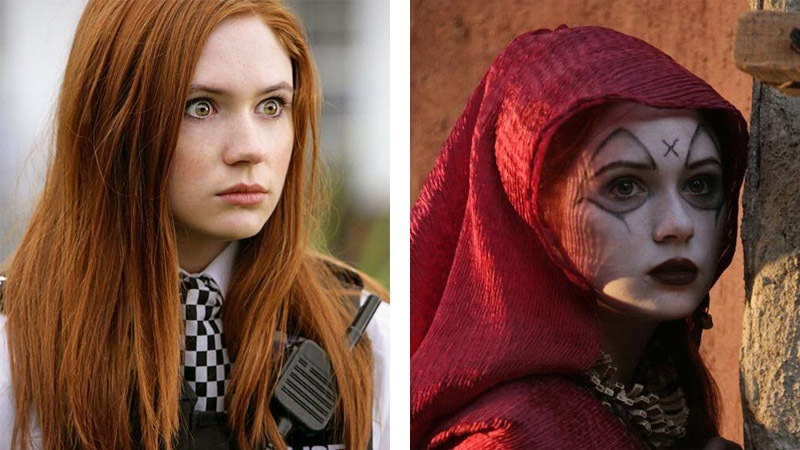 Karen Gillan was a Soothsayer in “The Fires of Pompeii” alongside Peter Capaldi who was Caecilius. Both later returned to play Amy Pond and The Doctor. Out of all of them, Eve Myles actually had a canonic reason to play both her characters. Gwyneth and Gwen Cooper are heavily implicated as being directly related (not by genetic line – as Gwyneth died before ever settling down, but by the timey-wimey shenanigans that the Time Rift was pulling). The old lady who dies at the beginning of Mummy on the Orient Express also dies on The Curse of Fenric. Richard E Grant as alternate 10th Doctor, alternate 9th Doctor, Walter Simeon and the Great Intelligence. Sylvester McCoy as the 6th and 7th Doctors. David Tennant as the 10th Doctor, MetaCrisis Doctor and various characters for Big Finish. Billie Piper as Rose Tyler and the Moment. Tom Baker as the 4th Doctor, Xoanon, Meglos and the Curator. William Hartnell as the 1st Doctor and the Abbot of Ambroise. Patrick Troughton as the 2nd Doctor and Salamander. Julian Glover as Richard the Lionheart in ‘The Crusade’ and Scaroth in ‘City of Death’. Michael Sheard as (deep breath…) Rhos in ‘The Ark’, Dr. Summers in ‘The Mind of Evil’, Lawrence Scarman in ‘Pyramids of Mars’, Lowe in ‘The Invisible Enemy’, Mergrave in ‘Castrovalva’ and the Headmaster in ‘Remembrance of the Daleks’. Christopher Benjamin as Sir Keith Gold in ‘Inferno’, Henry Gordon Jago in ‘The Talons of Weng-Chiang’ (and continuing on audio) and Colonel Hugh in ‘The Unicorn and the Wasp’. Michael Wisher as John Wakefield in ‘The Ambassadors of Death’, Rex Farrel in ‘Terror of the Autons’, Kalik in ‘Carnival of Monsters’, the original Davros in ‘Genesis of the Daleks’ Magrik in ‘Revenge of the Cybermen’, Morelli in ‘Planet of Evil’, and several voice-over roles. 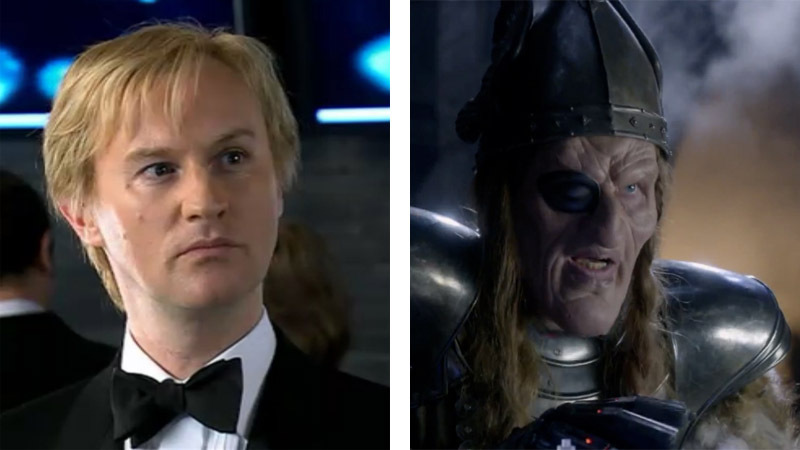 William Thomas as Martin in ‘Remembrance of the Daleks’ and Cleaver in ‘Boom Town’ (also a recurring role in Torchwood as Gwen’s father Geraint Cooper). Terry Molloy as the third Davros in ‘Resurrection…’, ‘Revelation…’ and ‘Remembrance of the Daleks’, and Russell in ‘Attack of the Cybermen’. Lalla Ward as Princess Astra in ‘The Armageddon Factor’ and as the second Romana from ‘Destiny of the Daleks’ to ‘Warrior’s Gate’. If we’re counting connected characters like Astra and Romana, and Caecilius and the Twelfth Doctor, given that both involved Time Lords choosing to regenerate into someone else’s face, then we can surely include Anthony Ainley as Tremas in ‘The Keeper of Traken’ and the Master from ‘The Keeper of Traken’ to ‘Survival’ (counting Eric Roberts as both Bruce and the Master in the TV movie might be stretching it a bit though… ;)). Sticking with the Master, Geoffrey Beevers as Johnson in ‘The Ambassadors of Death’ and the Master in ‘The Deadly Assassin’. Dan Starkey as various Sontaran clones (most notably Strax) and Ian the elf in ‘Last Christmas’. Jacqueline Hill played companion to the first doctor Barbara Wright was Lex in the fourth doctor episode Meglos. Katy Manning as Jo Grant/Jones and Iris Wildthyme, Wendy Padbury as Zoe Heriot and Jenny from a Doctor Who stage play. If you include voice acting then Gabriel Woolf was the voice of Sutekh in Pyramids of Mars and the Beast in The Impossible Planet/The Satan Pit. Peter Purvis played a Texan in “The Chase” before becoming Steven Taylor, the 1st Doctor’s companion. Edward Burnham played Professor Watkins in “The Invasion” (Patrick Troughton) and later played Professor Kettlewell in “Robot” (Tom Baker). Peter Purves appeared as two different characters in the same story, Jacqueline Wright appeared as two different characters. You forgot Ian Marter who was in Carnaval of Monsters and was Harry Sullivan. Eleanor Bron co starred with John Cleese in City of Death and Alexsey Sayle in Revelation of the Daleks.